Happy Saints: All Saints Day is coming! Here are some Happy Saints eBooks recommendations for your All Saints Day activities! 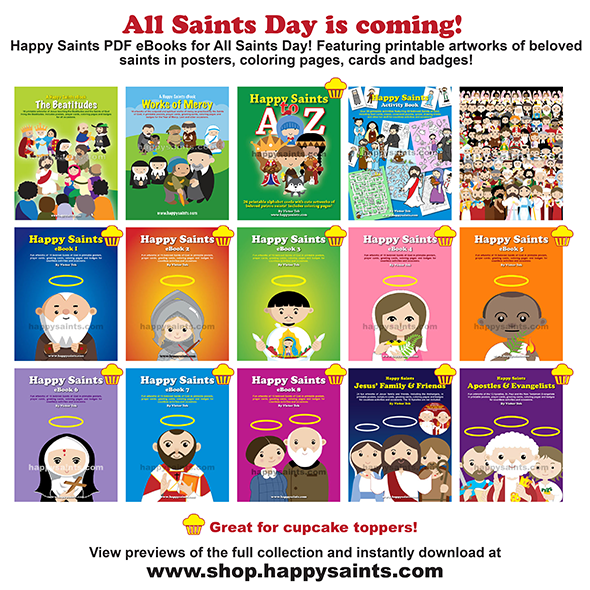 Happy Saints eBooks are downloadable PDF ebooks with printable cartoon artworks of saints. They are great for the family, school or church and you can print them again and again for non-commercial use! New ebook! Sainthood is all about living the Beatitudes that Jesus taught in His Sermon on the Mount. Learn how Happy Saints live the beatitudes in this set! The Year of Mercy has not ended! Learn about Happy Saints doing the spiritual and corporal works of mercy! Cute cartoons of 26 Happy Saints in alphabetical order! This is great for flash cards, memory games and much more! Full of fun and educational activities for the family! Includes mazes, crossword puzzles, find-and-color and much more! A single poster featuring over 100 Happy Saints! This is the flagship series that started it all. Each ebook features 15 beloved Catholic Saints in printable posters, badges, coloring pages and cards. You will find the most popular saints in this series e.g. Mother Teresa, Padre Pio, St. Augustine, St. Francis etc. In the same style as eBooks 1 to 8, this set features Jesus, Mary, Joseph, John the Baptist and many familiar saints of the New Testaments. If you are looking for the 12 Apostles, this is the set to get! In the same style as eBooks 1 to 8.